Prague 15 is changing for the better. Further proof of this is the transformation of the current heating plant, which lies near Bolevecká street to a place full of life and greenery. While in the past the heating plant was a blot on the landscape to all those who lived here, the whole area will be transformed beyond recognition. Finally, the residential nature of the site will be preserved such that the surrounding villas and buildings are not disturbed by the operation of the ugly building which stood here for many long years. 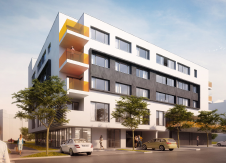 SMART LIVING BLV@Horní Měcholupy comprises a new apartment building in a slick orange and grey exterior based on Trigema’s Smart Living concept. Everyone will find their place here! Whether you’re single or a young family with kids, or middle-aged or older. 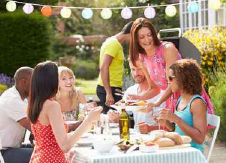 We can offer you all an extensive range of apartment sizes and fixtures, along with terraces, and balconies or recessed balconies. Trigema a.s. holding, which has operated for 21 years, since 1994, implements the BLV project through subsidiaries. Do you want to know more about what we take pride in, and what we consider poor practice? You can find our opinions on accommodation and Prague’s real estate market, along with regular analyses of the residential market in ourblog. In 2015, the scope of Trigema’s Smart Living concept has been gradually spreading across the whole of Prague. Phase I of the SMART apartments in Nové Butovice was completed in the autumn, and Phase II will be completed in spring next year. 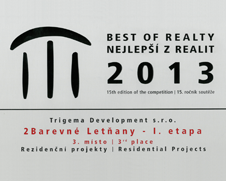 So far, we have completed more than 1600 apartments throughout Prague. 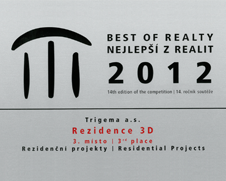 A new residential project in Plzeň is also under preparation. Like most of Trigema’s residential projects, the architectural design for SMART LIVING BLV@Horní Měcholupy comes from aIng. Arch. Daniel Smitka’s studio. This award-winning architect has been involved in residential building design for over 20 years, and has worked in architecture the whole of his professional life. He successfully completed his school leaving exams in 1985 at Construction Secondary School in Plzeň, from where he went to the Czech Technical University’s (CTU) Civil Engineering Faculty, then the Faculty of Architecture. He was involved in architecture and design during his studies, e.g. in Prague’s Škodovka (a division of the well-known Mladá Boleslav car manufacturer which was involved in, e.g., power station and power technology design) and civil engineering. After completing his state exams in 1993, he opened his own architectural studio, which he has run successfully up to the present day. He continues to collaborate with CTU as a fellow and is continuing his education. He has already completed over twenty residential projects – from family villas to multipurpose apartment buildings with hundreds of apartments. His extensive portfolio also includes administrative and industrial buildings, schools, hotels and unique science and technology park projects, sports and ski centres. It involves dozens of projects over the last twenty years. 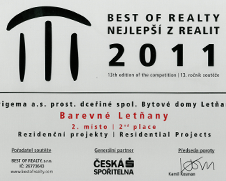 Many of these projects have been awarded prizes by leading Czech and international architecture competitions – of the various prizes which run into double figures, we should at least mention Building of the Year for the Central Bohemia Region, Real Estate Project of the Year, and one of the most important Czech awards, Best of Realty, which Daniel Smitka’s projects have received a total of four times over the last four years. Daniel Smitka is the principal architect for most Trigema projects, and he imparts upon them their unique appearance and exceptional human dimension.